What is the Mozu-Furuichi Kofungun? 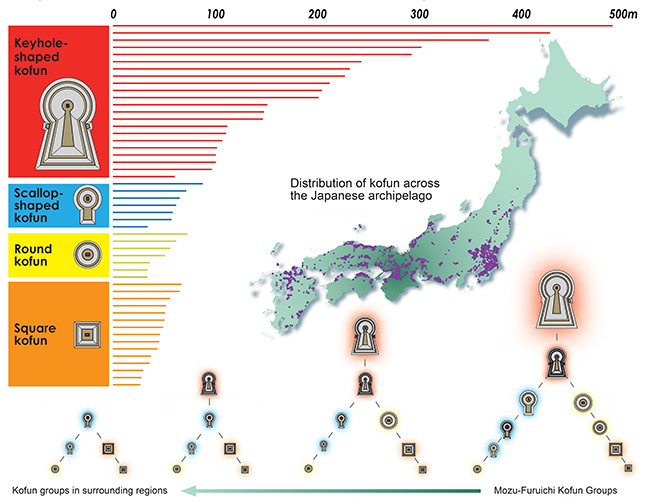 ▲ Nintoku-tenno-ryo Kofun The densely concentrated mounded tombs are contemporaneous, yet varied; they come in four standardized plan types – keyhole shape, scallop shape, round and square – and in an extremely wide range in scale from 20 meters to nearly 500 meters in mound length. 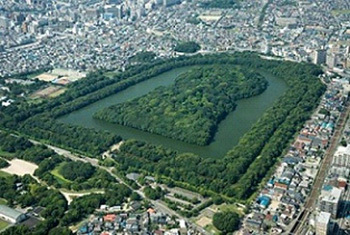 Moreover, a kofun is a not a simple earth or piled-stone mound covering over a coffin or a burial chamber. It is an exceptional architectural achievement that was designed as a stage for funerary rituals, decorated with paving stones and clay objects, and built with highly elaborate and geometry-based architectural planning and technology. for World Cultural Heritage Inscription.